During the past eight years, Matt Weiner has forced audiences to question who really is Don Draper. Since 2007, we’ve discovered that Don is a liar, a coward, a cheat, and many other things. For most of Mad Men’s run, Don has been steadily amoral about his situation, not often questioning his stature and integrity for his own personal crimes. Over the last seven episodes, though, we’ve seen Don attempt to come to terms for who is really is. He endows a million dollar check to Megan, attempts to forge a real relationship with a waitress named Diana, and ultimately leaves McCann, despite having the once in a lifetime opportunity to work for Coca Cola, to search for his own identity. The previous episode, “The Milk and Honey Route,” saw Don offer guidance to a troubled hotel staffer who seemed destined to fall on the same path Don did. By that time, Don has come to the realization of the morally apprehensible life choices he has made. “Person to Person” sees Don undergo a breakdown as well as rejuvenation. Since Mad Men’s inception, everyone has assumed that the series would end with Don committing suicide, jumping off a skyscraper, emulating the famous title sequence. Instead, we see him try to reinvent himself as a better man, giving his ring to Stephanie and going with her to a spiritual resort to obtain some meaning in his hectic life. Don’s transition in “Person to Person” can be seen through the three phone calls he makes through the episode. He first calls Sally, who alerts him that Betty has terminal lung cancer. When Don stubbornly demands to have custody of his children, Sally tells him to move on. During Don’s phone call to Betty, he hears the same thing, with Betty embracing her imminent death and only wishing the best for her family. Finally, Don calls Peggy, who frantically tells him the chaos he’s caused back in New York. Each phone call symbolizes the strides the characters have made. Sally finally obtains her desire to be treated as an adult, calling out Don for ignoring her wishes. Betty, who the series has often confined to the role as somewhat of an antagonist, has finally forged herself from her ex-husband. And Peggy, who has achieved so much since she was working as a secretary a decade ago, finds herself with the creative power she always dreamed of, as well as finding love with Stan. Many of the others of Mad Men’s ensemble have found their happiness as well. We see Roger happily sipping champagne with Marie, Pete and Trudy’s reconciliation, and Joan forging her own production company. Some of these storylines had already been wrapped up at this point, but it represents the great strides all these characters have accomplished. In the final minutes of Mad Men, Don obtains his wish for redemption by listening to a man reminiscing how unimportant he seemed to the rest of the world. His problem was the opposite of Don’s, yet he connects to the pain and anguish of being unable to be happy. 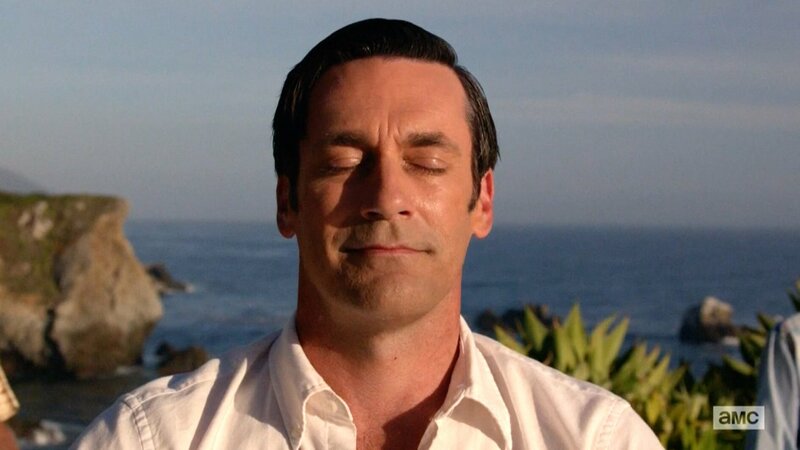 The final scene ambiguously ends with Don peacefully meditating over the Californian coast, before cutting to Coca-Cola’s “Buy the World a Coke” ad. While nothing is implicitly stated, it’s suggested that Don returned to New York as a new man and applied his philosophy to his work. What makes Mad Men so great is how it paints a cast of emotionally unfulfilled individuals who ironically craft images of human perfection in their advertisements. Weiner allows his characters to obtain happiness, but does so in a way that doesn’t seem forced or easy. Mad Men’s ultimate message is the need for revitalization, using the 60s as a setting to demonstrate the changing times. And so ends one of television’s greatest shows.